Home > Football > Wait til' Next Year? The Irish fall 4 yards short of greatness. Just 4 more yards for Notre Dame and they would control their own destiny to play in a BCS bowl. Clausen came up 4 yards short of of potentially winning the Heisman Trophy. So now what happens? Clausen plays great rest of season and gets invited to New York for heisman ceremony and Notre Dame ends up playing in the Gator Bowl. Some might think that we've done well to improve over last year but that's really not important. We're Notre Dame and our expectations should always be BCS win or bust. I dont want to keep having to say wait til next year. I want "just wait til the title game". We (Notre Dame fans) have been talking about the future for the past 5 years. In 2005 it was just wait til' next year we will have Brady and Samardzija back. I know we went to a BCS bowl in 2006 but we lost big to Michigan, USC and LSU. In 2006 we were all hype with National Title expectations; we werent looking towards future but immediatley after USC game in '06 i know at least I was saying "Oh just wait til we have Jimmy Clausen, no stopping him and all of our great recruits". My dad bought 6 tickets to that SC game in '06 so that my me and the rest of my family could go down and see a Notre Dame win. I left Southern Cal wanting redemption. Right after I left I thought about when next our best chance to get redemption against SC would be. It was this game, Clausen as a junior, at home. And again, we fell short. I probably shouldnt even talk about 2007; that year was only for the future. Again in '08 we were waiting for our great recruits to transform into great players. Well our great recruits are all emerging (Clausen, Tate, Floyd, Rudolph, etc.) but still we are left waiting for next year. Just waiting for those players to lead the Irish to greatness. I dont know about the rest of you but I am sick and tired of waiting. I'm not gonna say that I don't think that our future is bright but I don't think our future has us winning a title game with Weis. I will reconsider keeping weis if we go undefeated the rest of the way and a win over a decent oponent in at least the Gator Bowl. Otherwise, we should bring in Jon Gruden. He would be that hard-nosed but fun loving college f ootball coach. Pete Carol-esque?. If we were to bring in Gruden we would keep most of our defensive and offensive recruits like Martin and potentially more recruits that we might get this week. 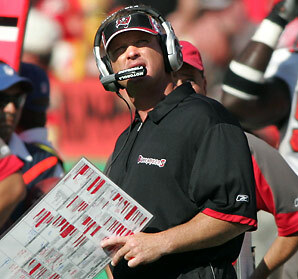 The recruits would look at Gruden's defenses with the Bucs and would come right to Notre Dame. I know it was Monte Kiffin coaching defense with those Bucs teams but Gruden would bring in that tough defensive attitude and possible some NFL assistants with him. 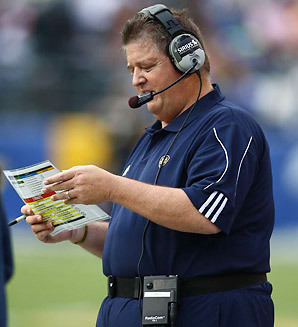 If Notre Dame wins out or just loses a barn-burner in a bowl game, Notre Dame should bring Weis back and see what he can do with Clausen. I dont think it would be a good idea to bring in a new coach and system when you have Clausen, Tate and Allen all seniors.There's a good chance it'd be Floyd's last year as well. Could be a complete waste of year for those great players. I would like to see what this offense could do next year rather than seeing all these great athletes waste a season. Would be better to do a coaching change the following season and bring in new system with Crist , Theo Riddick and Shaq Evans all being juniors. After this past loss to USC, Charlie's seat has gotten alot hotter. No more room for mistakes.